Find a vacation home to rent in Tranemo Municipality from our list of vacation rental properties. Campaya has over 27 vacation homes available in Tranemo Municipality, which give you the possibility to locate a unique accommodation in Tranemo Municipality which completes your check-list in search for the perfect self catering vacation apartments in Tranemo Municipality or vacation villas in Tranemo Municipality. Very beautiful cottage is located between the road to the city and the lake. It has its own bay and a sandy beach for the whole family. This beautiful and spacious holiday accommodation is situated peacefully in the countryside and agricultural districts. Well-maintained smallholiding in a quiet area with views to the lake and a private beach. Outdoor area with evening sun. Rich wildlife in the area. High and secluded holiday home in Sjötofta. Near the woods and fields and a good deposits of berries, mushrooms and moose are. The original style of this traditional, beautiful home has been partially restored. The home stands in Sjötofta in Västergotland. Children can play in the garden. This is a very unique type of caravan with plenty of space, which overlooks the salmon pond, where you can go fishing after requesting the owner. This red holiday house is near Ambjörnarp. A bedroom has a tiled fireplace and in the living room, an open fireplace is available. Enjoy playing on a large lawn. This lovely holiday home is situated on a farm with animals and a pond with salmon (angling possibilities after agreement with the house owner). Good hiking area. Garden room on 20 m2. This house is located near Sjötofta in Västergötland. It stands on an elevated ground with ample space around the house to run around and play. This small holiday house has a terrace at the back. The boat is on a trailer, not on a lake. The beds are made immediately upon arrival. The small forest lake is 50 meters away. Spacious holiday home in an area with a rich wildlife. Situated in the countryside. There are 7 km to a nice bathing beach. Isaberg slalom hill 20 km. Table dishwasher. Cosy, previous farm with stoves, situated approx. 10 km from Kroksjös Fishing Camp. Tranemo 10 km. 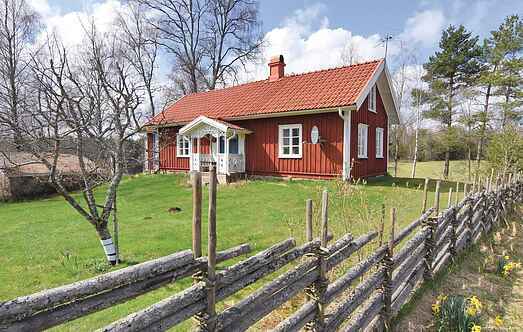 This cosy cottage is situated near Sjötofta in the western part of Småland. It is located high up amid scenic and tranquil surroundings, with only one neighbour. This holiday home is of a very high standard and is nicely situated by the edge of a lake. The house has a comfortable, temperated whirlpool and a bathroom with views over the lake.